Peter May closes his eyes and scrunches his face when he recalls his trip last September to Mississippi. He hears the industrial whirring of a huge cotton gin and sees a small, white-plank church bathed in a van's headlights. 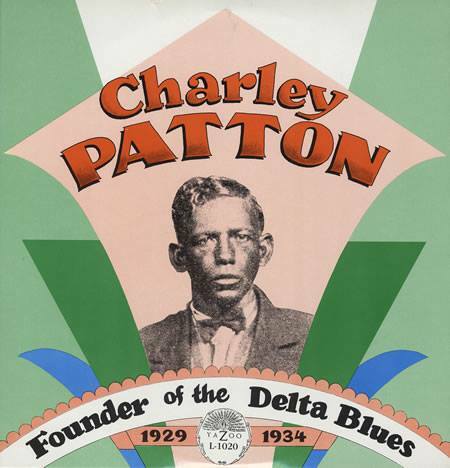 As he walks toward the clouds of cotton dust, he looks for the sight he wants to find: the grave of legendary blues musician Charley Patton. He grabs his guitar and camera from the van and ambles into a cemetery choked with knee-high weeds. He stumbles, looks around, stumbles again. 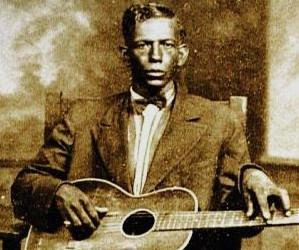 Then, he sees in front of him, chiseled in granite, the words, "CHARLEY PATTON, THE VOICE OF THE DELTA." He found it. His home. "Come on up and talk to us, Charley,'' May says, smiling. May is 35, a short, slender man with long, boyish, brown bangs. He rolls his own cigarettes, shaves every few days and helps his wife, Susan, take care of their four daughters, ages 5 to 11. He sells tires by day; he plays the blues by night. And May can play. He plucks the guitar strings like some jazz-cat drummer and sings in a bar-worn, scruffy voice about leavin', liquor, redemption and a girl named Laura Mae. Hear for yourself Friday at The Garage in Winston-Salem, Sunday at The Blind Tiger in Greensboro or next Thursday at Ziggy's nightclub in Winston-Salem. Or simply pick up his latest release, ``Black Coffee Blues,'' a CD of haunting authenticity filled with the ghosts of Patton, Robert Johnson and Blind Lemon Jefferson. Those were the very ghosts May has wanted to find. In September, he spent 14 hours on the road with three friends. 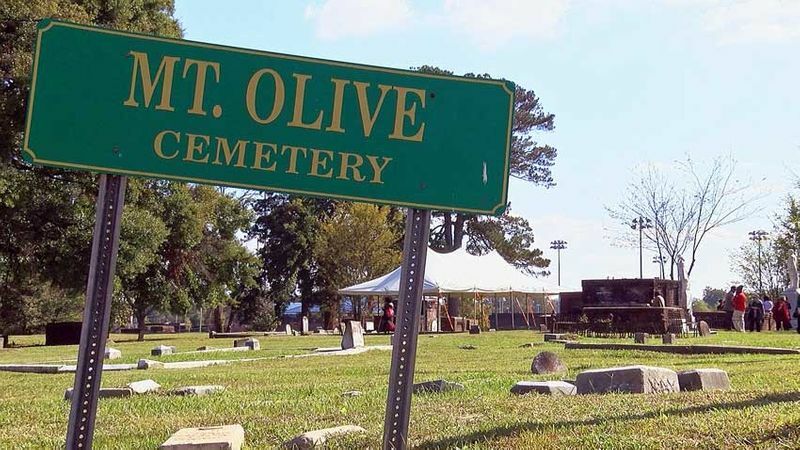 They traveled through the Deep South to pay respects to the people who had created the music they all loved. "Breathing that same air and walking on that same ground, it gives you a perspective you can't find in North Carolina,'' May says. May discovered Patton through listening to bluesman Skip James. 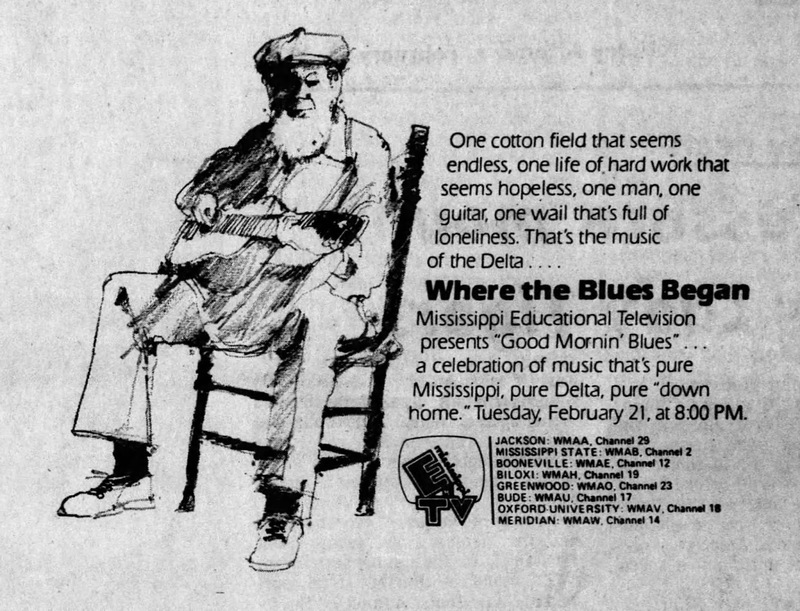 Then May created his own school to understand the man who had helped create Mississippi's rural blues, the foundation of today's rock 'n' roll. May read books. He listened to Patton's recordings. 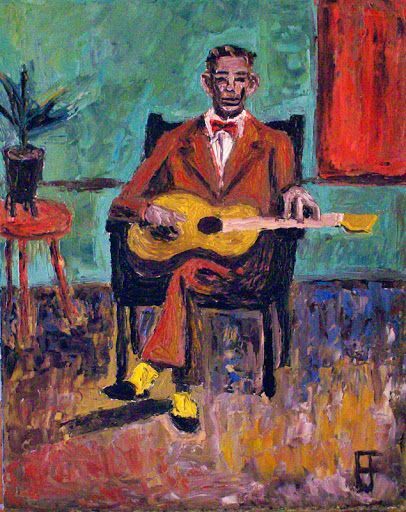 He went to a blues workshop in Connecticut and took private lessons in Massachusetts. Then he sat on his bed for hours, playing Patton's tunes over and over until he got them right. Finally, for his own self-styled graduation, he went on a blues pilgrimage to a cemetery south of Indianola, Miss. Then he lit one of his hand-rolled cigarettes, knelt beside the grave and, inside the blinding swath of the van's headlights, began to play ``Down the Dirt Road Blues.'' The tune seemed appropriate as he sat alone in the dark beside a dirt road in Mississippi. I'm worried now. But I won't be worried long. "It seemed like the air just soaked up that music,'' May says. May often wonders why he - a preacher's son from Winston-Salem - has become so intrigued by this black-born music. He hasn't an answer. But like many of us, he enjoys the search. Especially that night in Mississippi. Most of the time, a concert is just a concert. But occasionally a concert is a cause and that was the case recently when the Old Town School of Folk Music hosted a gathering of musicians to raise money to do right by a man named Will Shade. 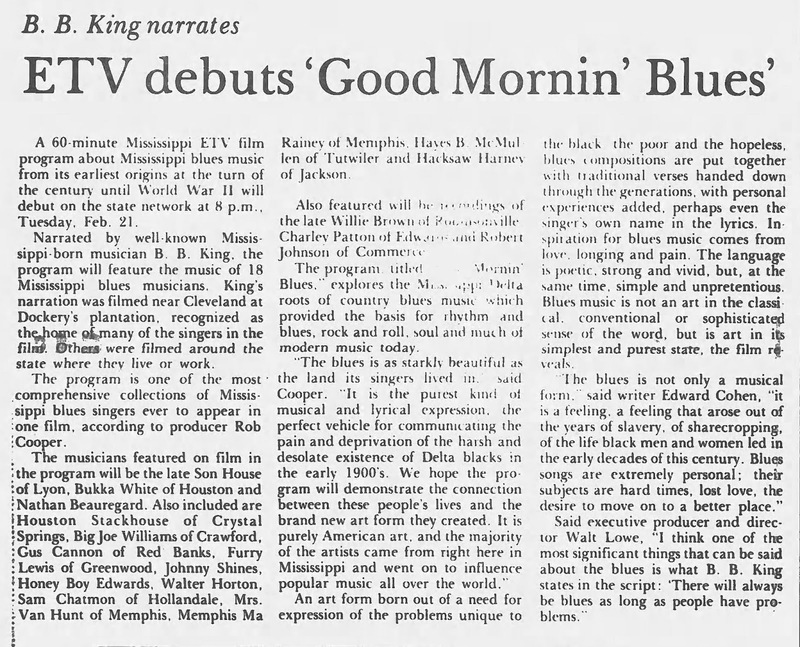 Unless you are a musicologist or a devoted fan of the blues, that name likely means little or nothing to you. But Shade is regarded as one of the giants of the genre. Born in 1898, he created the important-now legendary-Memphis Jug Band in 1927. He played guitar, harmonica and sang. He also wrote songs, among them "Stealin' Stealin'" and "On the Road Again." He and the band recorded a lot of tunes in the 1930s but the popularity of jug bands (loosely defined as bands using a mix of such traditional instruments as guitars, violins, banjos and mandolins, and such home-made instruments as jugs, spoons, washboards and kazoos) faded in the 1940s. Shade kept playing, kept forming new bands, but just as his music was beginning to attract attention from the generation of performers who would form such bands as the Grateful Dead, Lovin' Spoonful and Creedence Clearwater Revival, he died of pneumonia.Like so many musicians of his era and place, Shade died [broke]. 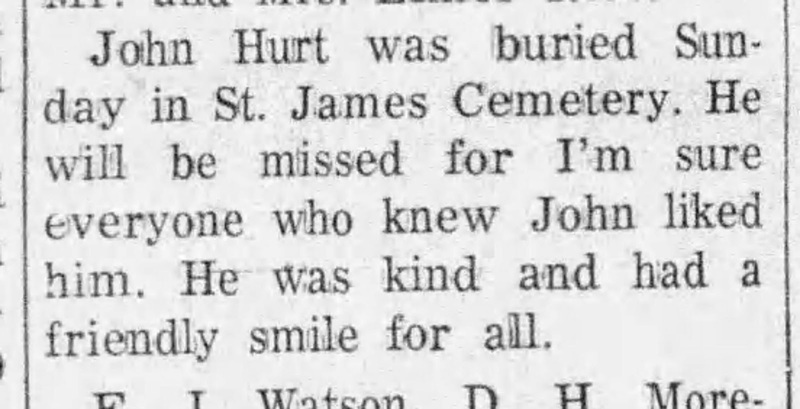 He was buried in 1966 in an unmarked grave in a pauper's cemetery. Arlo Leach, a teacher at the Old Town School, revered Shade. 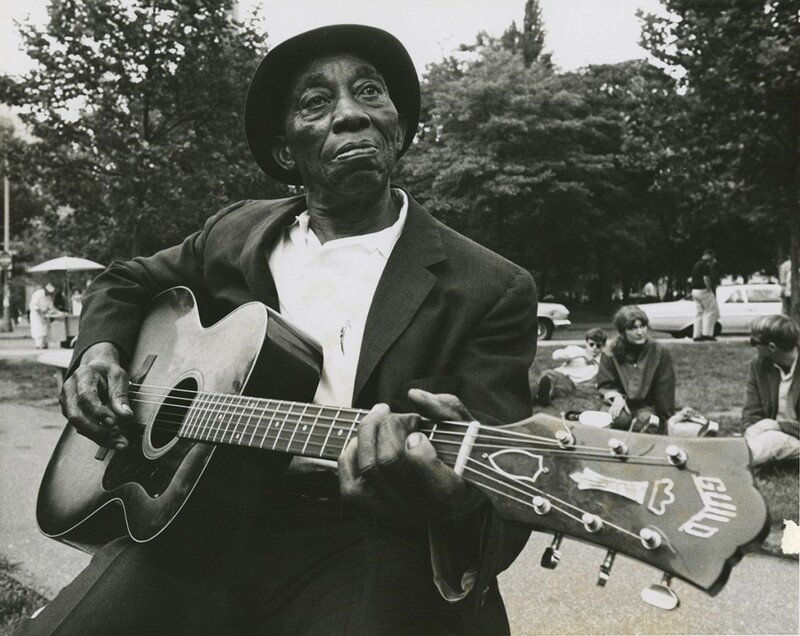 He started teaching guitar at the school and a couple of years later added jug band classes to his curriculum. 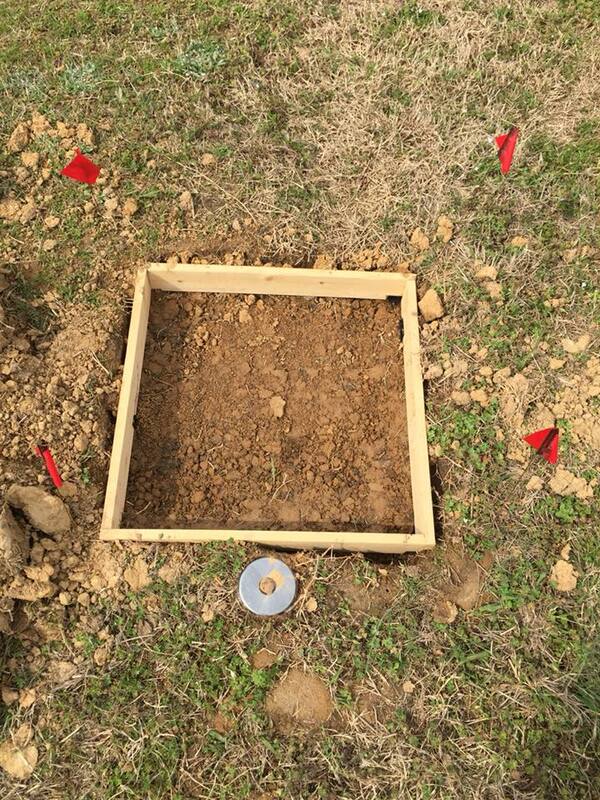 He has also made it a kind of mission to find the graves of the jug band greats. 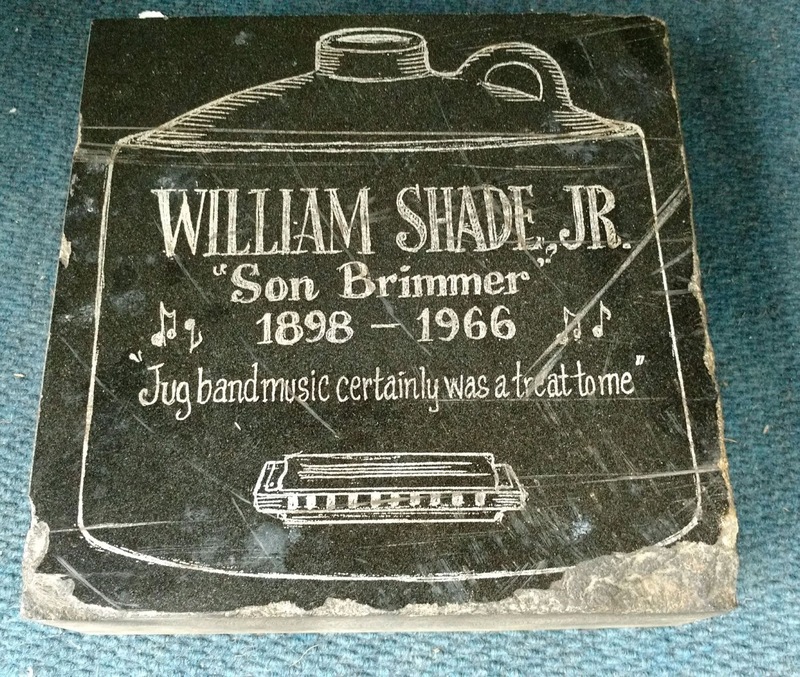 He was understandably shocked to discover Shade's final resting place in the fall of 2005, and it was he who had the idea for the Old Town School concert. It featured a number of big-name jug bands, including Leach's own Hump Night Thumpers, all donating their talents. 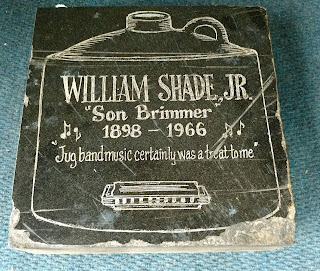 It was billed as the Will Shade Gravestone Benefit. replacement was installed in May 2018. One of the Hump Night Thumpers is Sallie Gaines, a former Tribune colleague, who plays the jug and washboard. "We work hard to learn the traditional jug band songs that musicians played in the river cities in the 1920s and 1930s," she says. "It is strange to see a bunch of urban white folks playing this old black music, but once you start you can't walk away." The concert was a great success. More than 400 people showed up and enough money was raised to get a headstone and send Leach and some other musicians to Memphis this month. 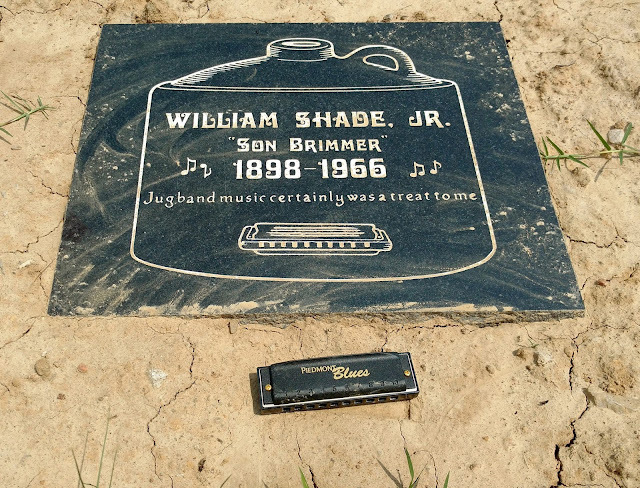 There they will mark Shade's grave and, you've got to believe, find some Memphis musicians with whom to have a jug band jam. 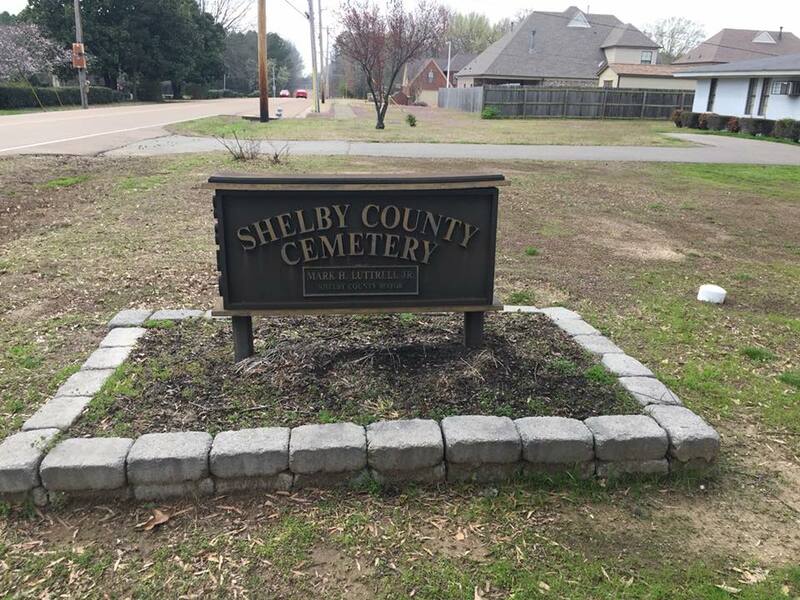 The second marker placed in honor of Will Shade in May 2018 in the Shelby County Cemetery. 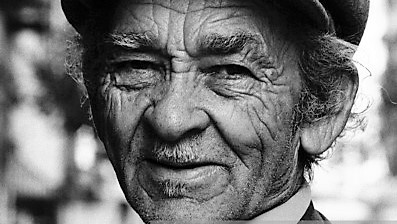 For me, the hit of the 1972 Smithsonian Festival Of American Folk Life, held in Washington, D.C., was the appearance of Eugene Powell. Eugene, who had recorded in New Orleans on Bluebird in 1936, was also known as Sonny Boy Nelson: his 'step-daddy' was one Sid Nelson. He was born at Utica, Hinds County, on 23 December, 1908. At about the age of six, a boy with a piece of wire and a homemade `arrow' shot the arrow into his right eye, resulting in his losing the eye. At the age of seven, the family moved to the E.F. Lombardy plantation in the Delta. Here he heard the singer/guitarists Prince Flowers and Rich Flowers. He also heard some of the prisoners from the nearby Lombardy camp singing and playing their guitars on Sundays, while he was still only seven or eight years old. About this time he took up the guitar: he recalls that he did not attend school much, possibly because of his impaired eyesight. His half-brother Bennie 'Sugar' Wilson, who is now deceased, played mandolin and may have been the inspiration for Eugene also to learn the banjo-mandolin. Eugene remembers an old, blind guitarist from Utica, known only as `Stackerlee', but he appears to have seen this man in later years, rather than in the time before he moved to Lombardy. Eugene also spent some of his formative years in Hollandale, and played there with `Hacksaw' Harney (`Can' of Pet and Can), and with Johnny Hoeffer, a guitarist who was killed at Panther Burn (Sharkey County). But Eugene preferred to work with Willie Harris Jr. more than anyone else. Willie came from a musical family — his brothers Doc, Ned and Sam all sang: Doc and Ned also played guitar. Doc died at Hollandale, Ned in Chicago and Sam is deceased too. Eugene last heard of Willie in Cleveland, Ohio, but there are reports of his being in Toledo and on Detroit's West Side in recent years. Powell thought Willie had not recorded before the trip to New Orleans, and said they were working together in Mississippi when one Willie Harris recorded in Chicago for Brunswick in 1929 and 1930, so it seems the Brunswick artist is another man despite some aural similarity. 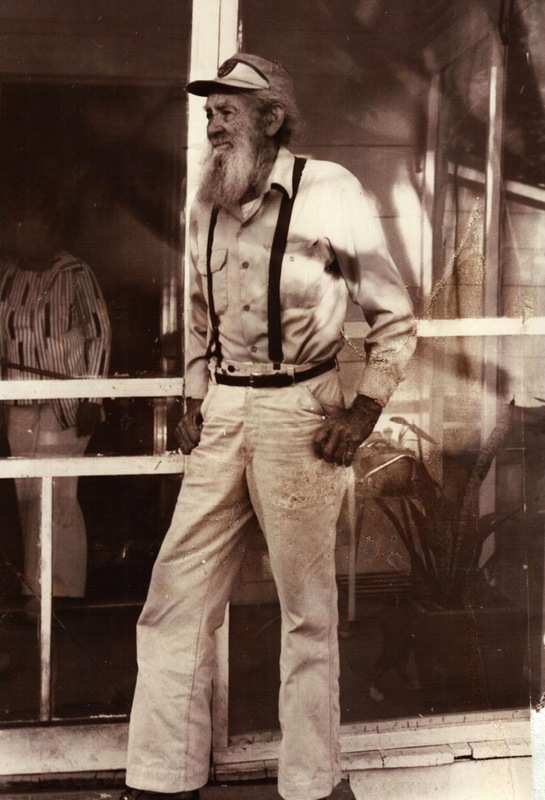 Willie was known as 'Brother', and commonly seconded Powell's fluid picking. 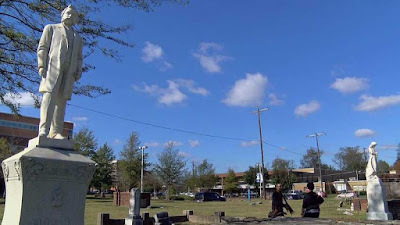 Other musicians remembered around Hollandale were Will Hadley, a guitarist who came into town with harp-player Robert Hill; and two brothers Sol (left-handed) and Touma, both guitarists, and another guitar-player Dennis. Eugene bought himself a Silvertone guitar in about 1933 and inserted an aluminium resonator into it like those found on the National guitars. He also fitted a seventh string, using the twelve-string models as his inspiration: the extra string was a 'C', an octave higher than the conventional string. This was the arrange-ment he used in the 1936 recording session. By about 1934, Eugene was in Marion, Ark., where he renewed his friendship with Hacksaw, and also recalls seeing guitarist Big Jim Richard-son, who was then an old man and weighed over 200 pounds. Powell remembers him singing `Bottle It Up And Go', apparently some years before Tommy McClennan recorded the song. Later Eugene went to Memphis, where he bought a Stella guitar. Meanwhile, he returned to the Delta, picking cotton between Delta City and Anguilla. Here he married a singer, Mississippi Matilda, in September 1935. However he was also well-known around Wayside, south of Greenville, at this time, with his partner Willie Harris. Eugene was known as 'Red' in this area because of his light-pigmented skin. 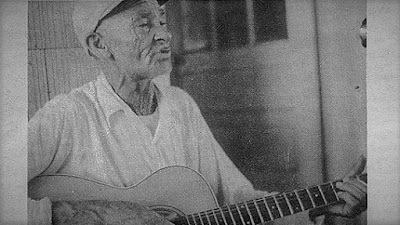 Bo Carter, still then a successful recording artist, heard Matilda sing, and she and her husband, along with 'Brother' and other members of the circle of friends of the Chatmon brothers, made the trip to New Orleans to record. Although Eugene was best-known in Mississippi by his real name, for some reason his step-father's name was adopted to give him a pseudonym. Generally his six sides are unusual. They feature very crammed vocal lines, with intricate picking by Eugene, who utilized a 'drumming' effect on the treble strings, while 'Brother' played the bass part. 'Pony Blues', his last title, is not the same as other songs with similar lames. 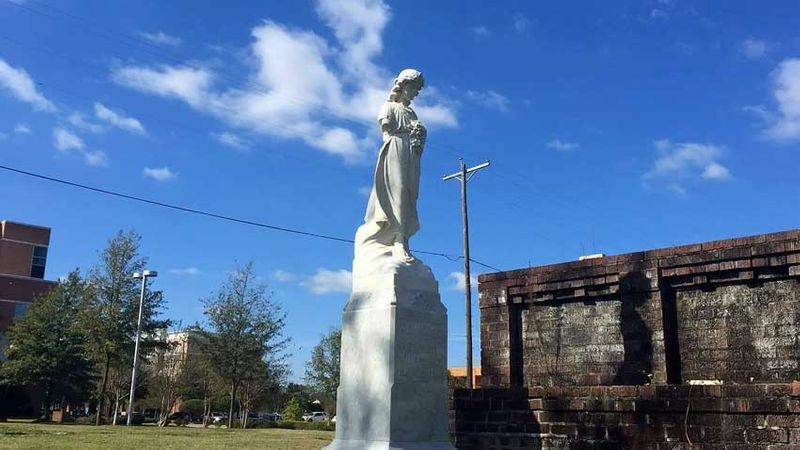 After this, Gene and Matilda continued to play music and pick cotton at Hollandale, Delta City, Scott and other towns in the Greenville/ Greenwood areas. Matilda had eight children by Gene, and she now lives with one of their daughters, Rosetta, in Chicago. Eugene remembers a number of other musicians in these areas, including a pianist, `C.B. ', who died of tuberculosis; Nate on harp (possibly Nate Scott, who was based around Drew); and a guitarist named Johnny Holt. Gene played with the late pianist, 'Big Fat', in Greenwood, and remembers guitarists 'Nub' and Johnnie Mac Hardy from around Indianola and Moorehead. There was also the late Andrew Hardy, a guitarist from that area who made a big impression on the younger Charlie Booker. 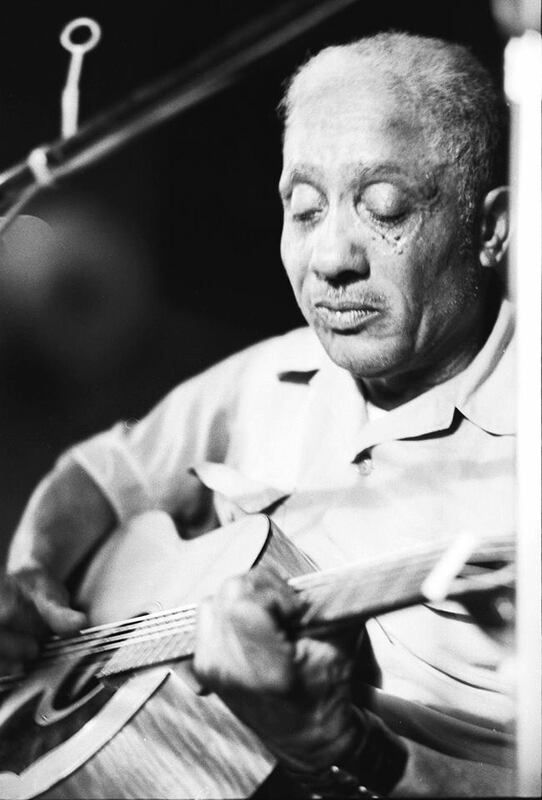 Another well-known and respected musician was Amzie Byrd, who played both violin and guitar. 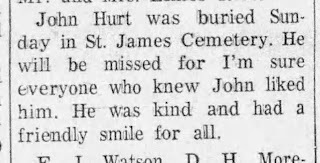 He had his own plantation in Humphreys County, between Belzoni and Hollandale, but is now deceased. Although the Library of Congress files show he recorded in Parchman behind Jim Henry and Eugene Wise in 1937 and Ross 'Po' Chance' Williams in 1939, there must be doubt about this: Eugene, Stackhouse and Hacksaw all knew Amzie and said that he was not in Parchman, although his brother had life there and his son also. Possibly pseudonyms were used for these recordings and Amzie's name was taken over completely? Amzie had played with a guitarist remembered as `Dulcie' in Hazlehurst. `Dulcie' also worked with Willie Fierce, Jack Holmes, Mott Willis and a jazz band known as the Nitta Yuma Band: he now lives in Greenville. 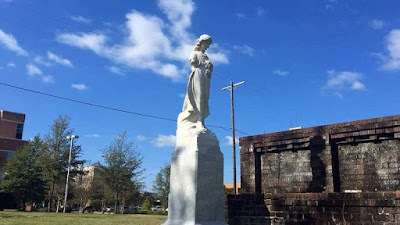 Another musician who travelled widely in the area was a woman who stayed in Memphis and is remembered only as 'Aunt'. She played guitar 'just like Sister Rosetta Tharpe', but from photos it is clear the two were not the same. Eugene also remembered a guitarist known as Ben Patton, who was said to be related to Charlie Patton. Ben was a 'little low' man who ) sang well and was supposed to have been in Parchman. He has passed, but was living in ;Drew and may be the man Dave Evans heard about, who was known as Ben Maree. In 1952, Gene and Matilda separated. She I continued to farm at Scott, north of Greenville, for a few years before moving to Chicago. Eugene seems at this time to have moved to Greenville. Here he played with the late piano-player `Blind Bob', and a harp-player Joe Reynolds (not the pre-war guitarist who recorded under that name). Joe also played with the late Tom Toy, a guitarist who stayed at Wilmot, out from Greenville, but was based at Tunica. Eugene recalls that Tom sang 'Catfish' and said he died in Florida. Then there was 'Vamp', reputedly an excellent guitarist, who is now a mail carrier in New York City: 'Vamp' is none other than Lonnie Holmes, who recorded for Trumpet with Willie Love in 1951, and sang Hand Me Down My Walking Cane'. Gene also remembered the late 'Big Shimmy', a guitarist from Knox Lake, near Leland. Eugene himself had married again. His wife took sick some years ago and he has devoted most of his time to looking after her. His playing became very much a part-time thing, and he increasingly played for himself rather than for an audience: he began to sing less, concentrating on the guitar. Eugene Powell with son 'Little Man', right, and friend, Greenville, Miss. 1978 (Valerie Wilmer) enthusiasm for it, were the basis of this arrangement. Fahey's booklet contained the first indication that Gene had been rediscovered, although in fact he had been recorded in Greenville by Gene Rosenthal and Mike Stewart the year before (1970), for Rosenthal's Adelphi label. However the strong bond between Eugene and his ailing wife had the unfortunate side-effect of preventing his travelling far from home, and any comeback on the college circuit seemed out of the question. 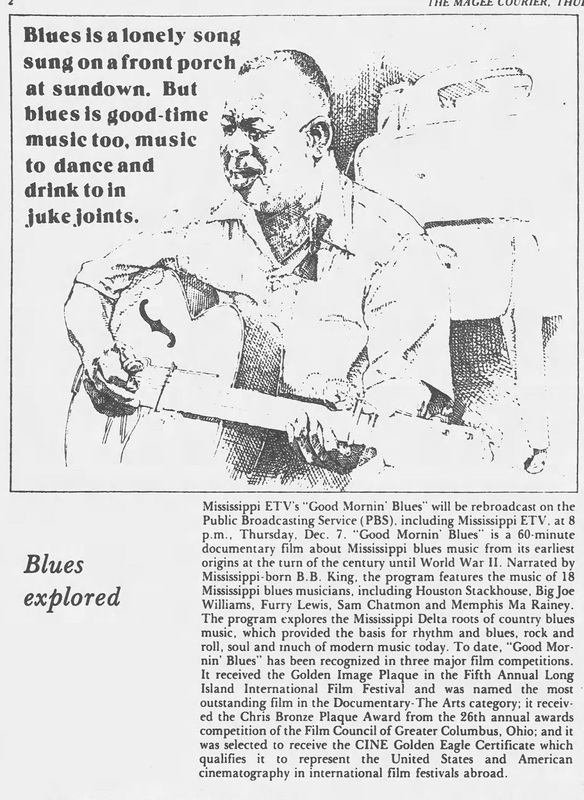 Finally, the 1972 Smithsonian Festival came near, and there were plans for special emphasis on blues from the Jackson, Mississippi area. Steve LaVere was asked to help bring people to the Festival and to assist in settling the performers who were to come. Steve and I discussed the possibility of Eugene going along, and as Gene was able to find a relative to look after his wife for a few days, he was included in the programme. The trip to Washington was great. Stack-house, Hacksaw, Sam Chatmon and Eugene had known each other for years, and it was like a reunion. To cap it off, we picked up Harmonica Frank in Cincinnati, and he and Eugene hit it off well, swapping yarns and so forth. flat on his lap, fretting it with a pen-knife, but it soon became clear that the song he liked best himself was a stomp, involving intricate finger-picking on the treble strings and much snapping of the bass string a la Willie Brown. Eventually he recalled about three verses and the piece became known as 'Sandy Field' because the first line ran: 'I was born out in the desert, raised up in the sandy field'. Eugene played guitar duets with Hacksaw, with Sam Chatmon and, from memory, Stack-house as well. Perhaps the most successful set was with Hacksaw, since their styles are closest, but Powell received a good reception through-out. Eugene also recorded further titles for Adelphi on 4 and 5 July, 1972, and the proposed album should be excellent. 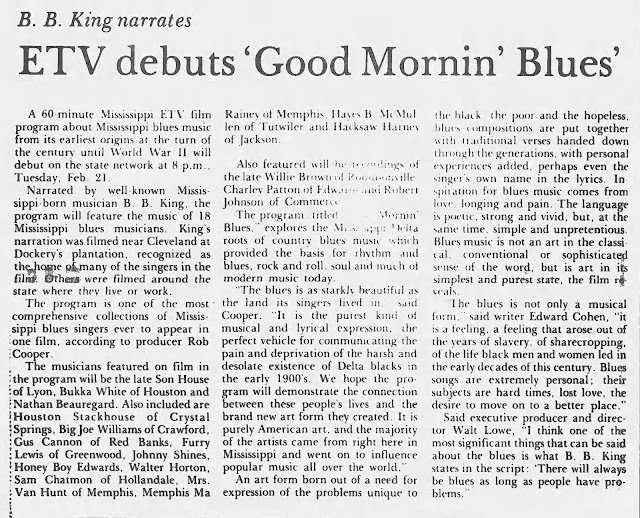 Gene then appeared at the second River City Blues Festival in Memphis on 24 November, 1972 and once again the reviews were excellent. He was to appear at the San Diego Festival in April 1974, with Sam Chatmon, but his wife lost her daughter and it seems that it will be even more difficult for him to get some time to travel in the future. But he is such an exuberant performer and talented picker that surely a solution will be found to enable him both to care for his wife and to receive some acclaim for his art. Sam Chatmon was one of the most remarkable individuals I have ever known. 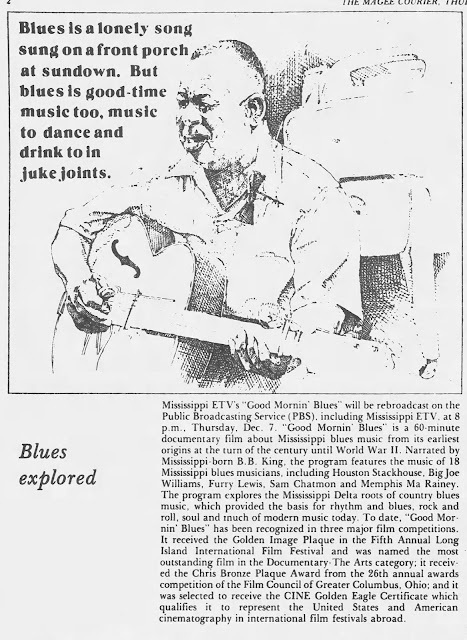 During the years he spent in San Diego (1966-1982, where he became an important part of the blues scene), I had a lot of chances to sit and talk with him. This excerpt is taken from one of those conversations. 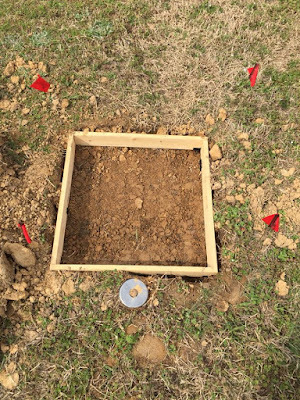 They used to have long troughs just like you’d have to feed hogs out of and would give you cornbread with as much rat fertilizer in the meal as there was corn. They’d put that old black bread in those troughs for the little children and make them eat out of there just like the hogs. They’d grease their mouths every Sunday with a meat skin on a string. My Daddy would always linger behind and try to get that meat skin, because it would be the only meat he could ever get. Every morning before they left the house, they’d have to come up to the master with a strap and let her whup them. Then she’d say, “You all be good little children. Go ahead now and get your breakfast.” And they’d line up at the trough. 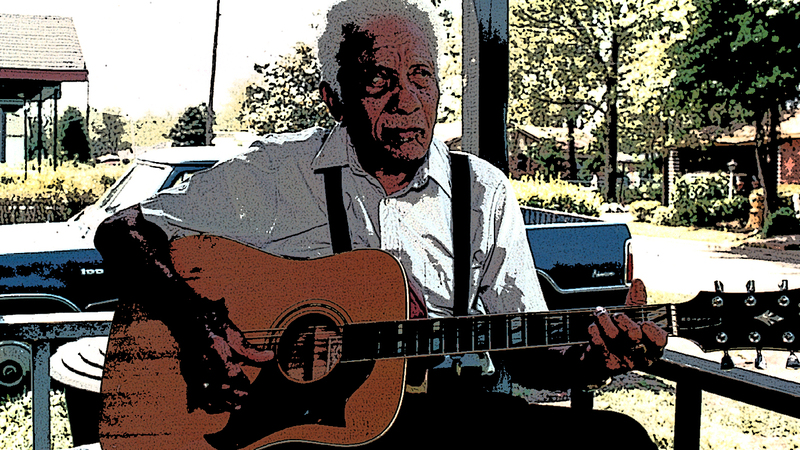 My Father would play music with old Milton Bracy, just two fiddles and no other instruments. 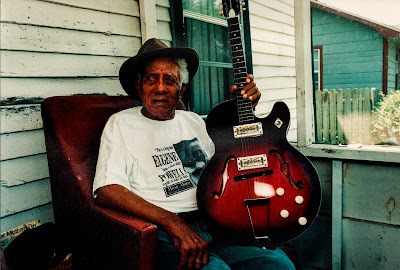 He didn’t play no music like we played, but just those old breakdowns: “Old Grey Mule,” “Chickens in the Breadpan Kickin’ Up Dough,” “Hen Laid the Eggs,” and all them things. He had whiskers down to his waist and sometimes he’d have to tie them to the side with a cord to hold them off the fiddle. He didn’t play too much by the time I was around but if my brother Lonnie wanted Daddy to play, he’d just start fiddling one of his old tunes. Then Daddy would say, “Boy, that ain’t no way to play it, bring that violin here and let me show you how.” Those old square dance tunes took a bow arm to play, but these blues and things takes a pull. Lonnie had learned to play the fiddle by reading the music. He was the only brother that could read. When the white folks wanted us to play something, they’d buy the sheet music in Jackson and give it to us. Then Lonnie would tell us all our parts and it was like we’d known it all our lives. Music was just a giving thing in our family. I got it from watching my brothers. It’s just like driving a car. You sit next to somebody and watch what they do and you can do the same thing with a little practice. If you ain’t got nerve to try it you can still make a little stab. My brother’s and sisters all played; my Daddy and Mama too. My cousins the McCoys [Joe and Charlie] and the McCollums [Robert, who later became Robert Nighthawk] all played too. We all played so many pieces, I could be here several hours just listing them for you. I wrote the words and Lonnie wrote the music for several of our best known tunes like “Ants in My Pants,” “Sittin’ on Top of the World,” “Stop and Listen,” “Corrina Corrina,” and “Pencil Won’t Write No More.” We also did all the old blues and written songs from the sheet music like “Alberta,” “Sheiks of Arabee,” and “Sleepytime Down South.” I started playing guitar when I was four years old. Even before I started to play I remember my older half brother Ferdinand [who made records under the name Alec Johnson] and Charlie Patton singing about the first blues I ever heard, something about “going down to the river” and “if the blues don’t leave me I’ll rock away and drown.” The first tune I learned to pick was “Make Me a Pallet on Your Floor.” Me and Lonnie put that out later as “If You Don’t Want Me, You Don’t Have to Dog Me Around” and folks thought it was a new tune that I’d got out. I’d sing a verse and then holler, “Oh, step on it,” and Lonnie would get out on that fiddle. When I was seven, I started playing bass viol with my brother Lonnie – bull fiddle they called it then. I had to carry a box along so I could reach it. I didn’t see no banjos until I was 18 in Memphis. I picked up the tenor banjo then tuned it like the first four strings of a guitar. All of us nine brothers played together. Lonnie and Edgar played the violins; Harry played guitar, piano, or violin; Willie and Bert played the guitar; Bo played guitar, banjo, and sometimes violin; and brother Laurie played the drums. I usually played the bass and sometimes guitar. Our cousin Charlie McCoy often joined us on the mandolin and sometimes his brother Joe came along too. Neighbor Walter Vincent joined us in 1921. We usually called ourselves the Mississippi Sheiks but sometimes in different groupings we were Chatmon’s Mississippi Hot Footers” and often just Lonnie and I would go out [sometimes joined by Charlie McCoy] as the Mississippi Mud Steppers. We used to play in the white folks’ houses or halls. Sometimes we’d play for a white man at a dance for three hours at six dollars per musician and then work 15 hours in the field for the same man for 50 cents the next day. When we put on a dance for our own people, we’d rent the hall for two dollars and charge them two bits at the door to get in. But mostly we’d work the white folks’ dances. The only other band around was the Carter Brothers and Henry Reed. Lonnie sometimes played with them because he didn’t like to farm. The rest of us brothers planted a crop every year and when we were working out crops, Lonnie’d go over to Raymond and play with the Carter Brothers. I don’t know any other bands around there then and we were the main band people would call. We used to play all the time at Cooper’s Wells and at Brown’s Wells where the healing waters were. That’s right near the county seat of Hinds County. Even after I moved to Hollandale in 1928, I’d leave off all the time to play for those people. They usually didn’t have much more than 35 couples there; that’d be about all you’d have. Sometimes we’d play for square dances too. In fact, the last dance we did was a square dance [shortly before Lonnie and Harry died]. It was at a hall built over the back of the Sunflower River below Hollandale. They were passing around whiskey in molasses buckets there. We never called the dances; a white man in a long dress coat and a fancy cane would do that. I always liked the blues, foxtrots, and one-steps the best, because on a square dance you’d never get a chance to change chords. Sometimes those tunes would last for a whole hour and just when you thought it was over, someone would call, “Promenade to the bar treat all the women folks to a drink,” and then we’d have to start back again. In 1928, we went to Atlanta and recorded for a fellow named Brock. He’s come out to our place and found us there and asked me, Lonnie, Bo, and Walter to go. He didn’t want no bass fiddle so I played guitar. 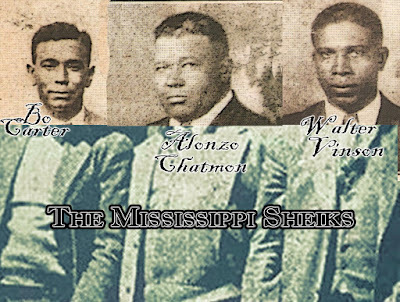 That's where we first used the name the Mississippi Sheiks as we were all from Bolden, Mississippi. They gave me 20 dollars and Lonnie, Bo, and Walter 30 dollars each and no royalties. That’s the time we put out “Stop and Listen” and “Sittin’ on Top of the World.” Bo changed his name to Carter so he could record separate from us. This guy Brock had him under contract. Later on my brothers Lonnie and Harry did the same so they could record separate too. Walter Vincent became Walter Jacob for the same reason. I never changed my name for any reason except at birth. I was named “Vivian” and I changed it to “Sam” because that was a girl’s name and I didn’t want to be named after no woman. In the year of 1937 I lost three brothers (including Lonnie and Harry) and two sisters and after that our band didn’t play together. Also my picking partner Charlie McCoy moved on to Chicago to join his brother’s band (the Harlem Hamfats). I took up picking some with Eugene Powell (AKA Sonny Boy Nelson) but I never did any more recording. I kept farming til 1950. I rented that land and worked it ‘til I quit with my own team and all. Then I went to work as a night watchman and bought me a house and a half acre. I didn’t play much music until 1965 when Ken Swerilas [a San Diego record collector] came by and talked me into coming out to California to play. Starting in 1966 Sam started coming regularly out to the West Coast, where he became part of the regular lineup at THE SAN DIEGO STATE FOLK FESTIVAL in 1969. He remained a part of that festival until 1982. During that time Sam made new recordings for Blue Goose, Rounder (which I had the honor of co-producing) and Flying Fish (he also recorded sides that appeared on collections from Advent and Arhoolie and there was an LP on an Italian label recorded by a couple of Italian collectors in his hometown of Hollandale). Shortly before his passing Sam took part in a series done by Alan Lomax called “Confessions of the Noble Old” for PBS television. He died in 1982.